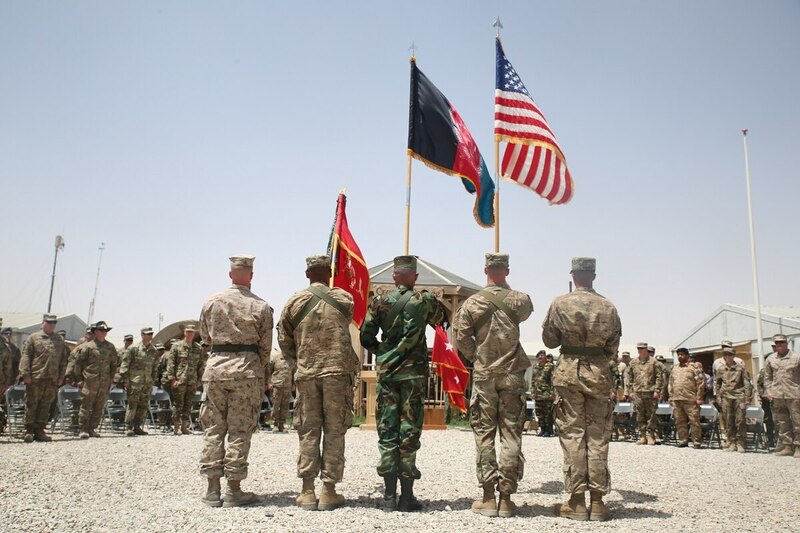 WASHINGTON — As the Trump administration contemplates sending additional U.S. troops to Afghanistan, a bipartisan group in Congress has demanded a floor debate on the war's endgame and whether it remains in America's interest to remain engaged there militarily. On the eve of NATO's highly anticipated summit in Brussels, Republican Rep. Walter Jones of North Carolina and Democrat John Garamendi of California will greet the media in Washington on Wednesday to explain their proposed legislation seeking to halt, with few exceptions, any further financing for U.S. activities in Afghanistan. After 16 years, victory there is no longer attainable, they say, nor is the effort worth continued investment in American blood and treasure. "Tell me your definition of victory. What is it? Street cars going down the roads that the Taliban blew up?" Jones, who introduced the bill, asked rhetorically during a recent interview with Military Times in his Capitol Hill office. "Hell, we've been training the damn Afghans for 16 years. You can train a monkey to ride a bicycle in three." More than 300 current House members were not in Congress in 2001 when lawmakers last voted to authorize the use of military force in Afghanistan, the congressman has noted, highlighting what's become an intensifying discussion in Washington as America's longest war, once more, comes to a crossroads. Jones, among others, has said lawmakers are obligated to intervene and either stop financing the mission in Afghanistan, or establish clear new benchmarks for determining success or failure. By doing nothing, he said, Congress is abdicating its responsibility. "From a political standpoint, and it really is sad for me to say it this way, but maybe members of the House would rather the president have blood on his hands instead of we in the House have blood on our hands," Jones told Military Times. "That's just my feeling. I can't prove it. But I know one thing: We're not debating any foreign policy involving our men and women in uniform. And it's both parties crying for a debate." His bill has nine cosponsors— three are Republicans, six are Democrats — and was recently referred to the House Foreign Affairs and Rules committees. In late-April Jones also wrote to House Speaker Paul Ryan imploring him to permit the debate. Since 2015, Jones has written at least seven such letters — nearly all co-signed by members of both parties — pressing the issue not only for Afghanistan but Iraq, Syria and elsewhere. He's one of many lawmakers who've spoken out on the issueas the military's campaign against the Islamic State has grown more expansive and nebulous. Ryan's communications staff did not immediately respond to questions from Military Times seeking to gauge the speaker's receptiveness to an Afghanistan debate specifically. In the past, he's indicated support for re-examining the law authorizing force against ISIS, which has a potent affiliate entrenched along the Pakistan border in eastern Afghanistan. Today, there are approximately 13,000 U.S. and NATO troops in Afghanistan focused primarily on training and advising Afghan security forces in their endless battle with Taliban. A separate, smaller counter-terror operation continues to target al-Qaida, ISIS and their numerous affiliates. U.S. troops continue to face significant risk there. Three have died in combat since January, and at least 31 others have been wounded. Wednesday's news conference on Capitol Hill comes as President Donald Trump prepares to lead the U.S. delegation in Brussels a day later. Amid worsening security in several of Afghanistan's populations centers, top American commanders have declared the campaign a stalemate and sought an increase of between 3,000 and 5,000 troops with hopes NATO will at least match them. The path ahead is said to be a matter of disagreementamong Trump's top advisers, some of whom are apprehensive about deepening America's commitment when the outcome remains uncertain. The Pentagon appears supportive of sending more troops and having them begin to work with the Afghans in smaller units that are closer to the action. Long-term, officials say, the objective is to set the conditions that will enable the U.S. to maintain a counter-terrorism presence in the region and prevent the sort of lawlessness that could destabilize Afghanistan's neighbors. Both Pakistan and India possess nuclear weapons. There's mounting concern, too, about the increasingly overt efforts by Russia and Iranto influence regional affairs. During a news conference last week, Defense Secretary Jim Mattis indicated a decision on troop numbers was coming "very, very soon." His top general, Joint Chiefs Chairman Joseph Dunford, said that while he was encouraged by recent talks with his NATO counterparts and their "enduring commitment," a decision hinges on the president's takeaway from Brussels. Jones and other critics say the U.S. has sacrificed enough for Afghanistan, and that the war's principal objective — to find Osama bin Laden — was accomplished in 2011 when the 9/11 mastermind was killed in neighboring Pakistan. Lawmakers decry the war's cost, both in lives lost and taxpayer money, and many have grown weary of the Afghan government's continued struggle to field a competent military and crack down on corruption. Since the U.S. invasion in 2001, more than 2,400 U.S. troops have lost their lives and more than 20,000 have been wounded as a result of the violence there. The Afghan security forces have suffered far greater losses, according to John Sopko, who as the United States' special inspector general for Afghanistan reconstruction has documented the war's toll for the last five years. In his most recent report to Congress, Sopko noted the Afghans lost twice as many soldiers and police officers in 2016 than U.S. forces have for the entirety of the war, calling the casualty rate "unsustainable." The taxpayer expense is well north of $800 billion, and Sopko has meticulously documented myriad examples of wasteful spending or outright corruption. In the last year alone, nearly 1,400 Afghan defense officials have been fired for such misconduct, according to his most recent report. "It's hard for me to believe, with all of the proof of waste, fraud and abuse, that there's been no policy debate on Afghanistan since 2001," Jones told Military Times. "I don't know if I'm living in a different world, but everyone around here seems like 'well, that's just the way it is.' We continue to put the money down a black hole." Jones is a longtime member of the House Armed Services Committee whose congressional district includes Marine Corps base Camp Lejeune, from which 300 Marines recently deployed as part of a task force to train and advise the Afghans in Helmand province. He has watched the war closely through the years, and grown frustrated with the long line of generals who continue to suggest there is still hope for the American mission there. In February, the war's top commander, Army Gen. John Nicholson, told Congress that with a fresh infusion of manpower, it will be possible to "find success" within four years. That'll mark 20 years in Afghanistan. "You would think," Jones said, "that after 16 years, someone would say to the secretary of defense and to the administration 'I think we've done all we can do to change this country.' "